Each wild mushroom has a secret place in the deep of the forest. 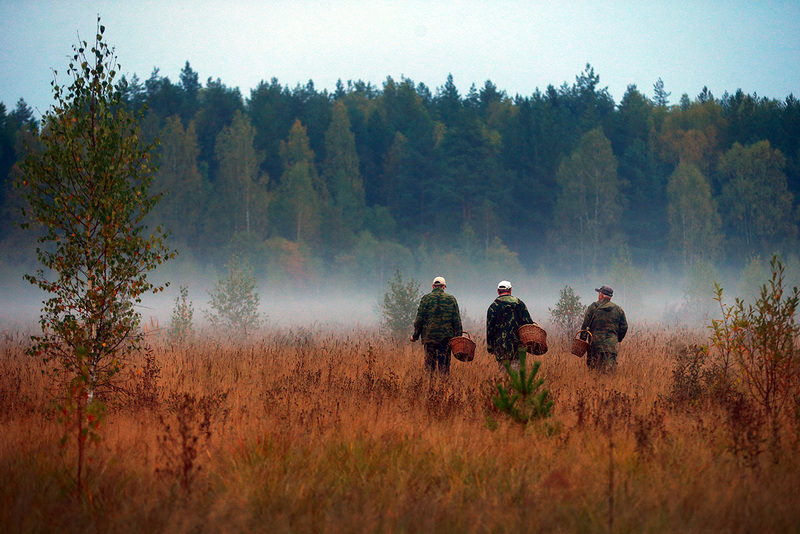 Picking wild mushrooms is an ancient way of 'meditating' in Russia. In the forest, immersing ourselves in the search for wild mushrooms, we forget our daily lives and are at one with nature. This alone should be a sufficient reason to hike in the forest. But mushrooms make the experience even tastier! With the advent of summer, trains and buses heading out of the city are full of people equipped for a forest expedition. Instead of backpacks and tourist gear, they carry enormous wicker baskets. These people usually can be distinguished from other passengers by their cheerful anticipation of an upcoming adventure. You will not have to think long to understand that these are wild mushroom pickers and they are going to their favorite and often secret "mushroom place." I believe that mushroom picking, or, as it is sometimes called, "the silent hunt," is a genuine and almost exclusive Russian hobby. Nowhere else in the world have I seen people make a cult of searching for edible mushrooms.This is much more serious than hunting, fishing or picking forest berries. Apparently, it is based on gastronomic interest: to stock up on a delicious and nutritious product, which in various forms can be preserved for a rather long period of time. But people pick mushrooms not only for this reason. I'll dare say that this culinary hobby is a type of sacrament that involves a whole range of rituals and ceremonies. My parents are dedicated veteran mushroom pickers. As long as I can remember we always spent the weekends picking mushrooms. Dad always knew which part of the forest that year had a good mushroom harvest, and he was never mistaken. I do not know how he managed to know. I guess he had some kind of special intuition, which, unfortunately, I did not inherit. And honestly, I was never able to pick even a third of what he picked. We separated in the forest - each went his own way. The silent hunt cannot tolerate idle talk and requires maximum concentration. It is said that mushrooms like a good picker. If a person is good, they all appear in front of him, longing to be placed into his basket. Unlike most other countries, in Russia wild forest mushrooms are held in particularly high esteem. There is a certain classification of mushrooms according to rank. It is relative, if not even subjective. Veteran mushroom pickers have heated debates about which categories should be assigned to which mushrooms. The first category, or the noble mushrooms, includes the porcino, the red-capped scaber stalk, the rough-stemmed bolete, the tiger milk mushroom, the honey fungus, the chanterelles and the milk-caps. They have the most nutritious qualities and are the most delicious. Usually they are cooked in all possible ways: fried, stewed, boiled, and marinated. They can be dried for the winter in order to be soaked and quickly prepared afterwards. The second class includes the russula, the woolly milk-cap, morels, the xerocomus, champignons and others. Perhaps they are not as delicious and require some preliminary thermal processing, but they are also common guests in Russian kitchens. My favorite is the porcino. Frying is the best means of preparation, especially with potatoes. 1. Cut the clean porcini into small slices and place onto the frying pan, on which the onion has already been fried, reaching a semi-transparent state. It is better to cut the onion into semi-rings. In the process of frying the mushrooms shrink in size by half and emit a juice. When all the liquid evaporates (in about 15 minutes), add the potatoes. 2. The potatoes should be cut as straws and thoroughly mixed with the mushrooms. The dish should be ready in ten minutes. Check the potatoes: as soon as they become soft, the dish is ready to eat. Do not forget to stir it. 3. I personally prefer the potatoes to have a crispy crust, which is why I prepare the dish without a lid and add the salt and pepper at the very end. Stir again and sprinkle with dill and parsley. Serve warm. Fried potatoes with mushrooms is an incredibly delicious dish that everyone loves. Bon appetite! Learn how to ’domesticate’ wild Russian "hedgehogs"
Why is honey a Russian’s favorite cure-all?